Mobile Retail is hoping to following up on the success of food trucks. The “Fashion Truck” concept that started about 3 years ago in cities like Nashville, New York and LA is spreading quickly across the US. The proprietors of the pop-up boutiques hope to follow up on the success of the food truck craze. Fashion trucks appear to be taking advantage of a shifting population and low overhead. From an experiential vehicle perspective the mobile retail movement will hopefully lead to some creative vehicles and trailers. The Growing Mobile retail sector seems to be more than a few people capitalizing on a temporary trend. Denver, CO has at least 3 mobile retailers. The Tour de Fashion truck, created from a converted FedEx truck pioneered the area with a heavy local inventory. The Denver Fashion Truck followed and The Brick & Mortar General Store launched this summer. 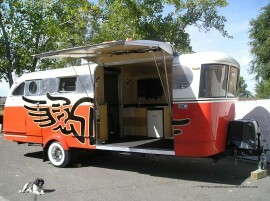 Brick & Mortar is the most interesting in terms of vehicle choice with their black 1964 Aristocrat trailer. Tour de Fashion co-owner Matthew Faas expects more entries into mobile retail and has founded the Colorado Mobile Retail Association, a branch of the national governing body, to give the growing sector a voice. “The more the better,” seems to be a sentiment of mobile retail. Many proprietors are looking for complimentary businesses to coordinate stops. As Brick & Mortar’s Allison Shaw stated, “With things like trailers and food trucks, one truck complements an event, but several make an event.” The Fashion Mobile even lists instructions on how to create a Fashion Truck on their website. The Denver Fashion Truck is looking to add to it’s own inventory of pop-up vehicles. By adding a second Fashion truck they could have separate “mens” and “women’s” trucks. Pop-up retailers are not just limited to individual metro areas. This year the Buffalo Exchange is celebrating it’s 40th anniversary with a nationwide mobile tour of their vintage Airstream turned pop-up store. Straight Down apparel has two trailers that travel to events across the US. Their “Big Red” trailer is one of the best looking conversions we have seen. Mobile retail is not limited to local craft or the hipster movement. Straight Down features apparel for the golfing community and Pursuit’s mobile suit store in Columbus, OH presents a very sophisticated alternative to the traditional store fitting. There are many questions concerning the legality of mobile retail. There are some rules but as occurred with online retail disrupters, the rules tend to follow the trends. For now most mobile retailers are subject to the same rules as food trucks and should probably stay out of denser downtown areas. But that is sort of the point of mobile retail. Taking the shopping experience into neighborhoods and communities that don’t already have it. Staying on the fringe also keeps the mobile vendors from stepping on the toes of traditional shopkeepers. Why does mobile retail work? Mobile retail has fewer start up costs and less overhead than traditional retail. Shopkeepers can cater to people that want a one of a kind goods or prefer to shop crafts made locally. Mobile retailers also rely heavily on social media (free) to get the word out on where they will be setup. As a result they are the curators of an engaged community. Straight Down’s vintage pop-up retail store. 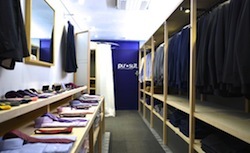 The more interesting question is what purpose is mobile retail serving? With big box retailers going bust due to online shopping why even start a physical retail store? NPR’s , Demographic Shifts Contribute To The Changing Face Of Retail article suggests that retail is integrated with housing trends. Simply stated, their has been a shift in preference from living in driving distance of shopping to living in walking distance of shopping. It’s not just the millennials who are responsible for the change. Baby boomers are also looking for communities that offer living, exercise, and shopping all in walking distance. With both these massive generations pushing for the shift to mixed use, large commercial campus areas like the Research Triangle Park in North Carolina are quickly restructuring by adding retail and residences to this classic office park design. Fashion trucks may be bridging the “mixed use” gap for communities and neighborhoods that can not rebuild or rezone quick enough for residents. As suburban residents decide they want to walk more and drive less for health, financial, or environmental reasons mobile retail seems to bring them the retail experience they want today.